Do you fancy hide the cables or router you have around the house that do not exactly give it an attractive look? If this is the one things that makes your house look less beautiful, than you have to take some measures into it. Take the knife that you prepared and start by cutting all the pages from the books, so that the only thing left is the nice hard cover of them. Better do this with the books that you no longer read, with those that have a duplicate in the house or just do this and replace the cover with something else. 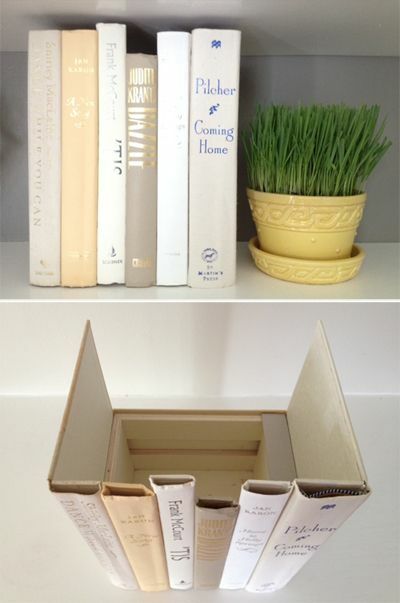 This way you will remain with both the book and use the cover to something good for the house. Do this with all the books that you think are neccessary to cover your space. Next thing to do is to take the end of the books and start making your spine. Take each book and cut the front and the end cover. Make sure that you leave a little space to use for glue, on each side of the spine. As, they need to the glued with the rest of the spines. Do this in turn with all the books you have apart from the ones that you want to use as a front cover and as a back cover. This is the next step when you actually create the front and the end cover. Make sure that when you cut the spine, leave the crate wither at the front or at the end cover. Then just fold and glue in order that it is not seen. Take the glue, form the book-line you want and start gluing them to the wooden box gently. Make sure that they have all the same height. If they do not have the same height just cut them until they give the look and feel you want. Enjoy the “book shelve” that you just created.